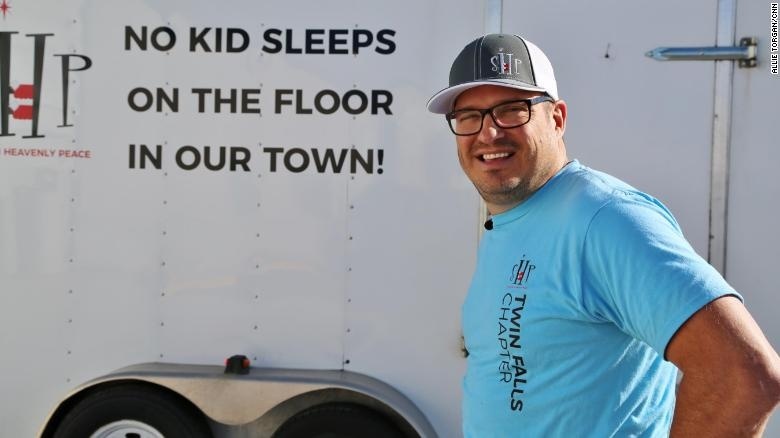 In 2012, when Luke Mickelson of Sleep in Heavenly Peace and his family took the time to build a few bunk beds for local children that were sleeping on the floor, they never could have imagined the long-term effects of that decision. Since quitting his high-paying job to dedicate all of his time to Sleep in Heavenly Peace, Luke has been absolutely floored by the response from those around the United States who have caught his vision and refuse to allow kids to sleep on the floor in their towns. Not long ago, Luke and the Sleep in Heavenly Peace team were featured on Mike Rowe's "Returning the Favor". The response from people looking to join the fight for children sleeping on floors was astounding. But the excitement didn't stop there! Luke Mickelson has been named one of the Top 10 Heroes of 2018 by CNN (read the article here), and SHP could not be more honored or grateful for CNN's belief in Luke's vision and for this opportunity. As one of the top 10, Luke has the opportunity to be named "CNN Hero of the Year" and to receive $100,000 for Sleep in Heavenly Peace. All he needs is your VOTES. Each of the top 10 heroes can be voted on every day 10 times a day, which means you can vote for Luke using your email or your Facebook account 10 times per day. Voting closes December 4th, so the more you can vote before then, the more of a chance Luke has of winning the $100,000 for Sleep in Heavenly Peace. Getting these funds would be HUGE for SHP, as it would allow for the Chapters to build beds that have been requested at a faster rate. Thousands of bed requests have flooded in, and SHP works hard to fulfill those every day- but materials cost money, and sometimes that can be a hinderance if SHP doesn't have the money to pay for the materials needed to fulfill requests. By voting for Luke, you could help get more kids off of the floors and into beds of their own sooner rather than later. Will you support us in this? Will you commit to voting 10 times a day for Luke?